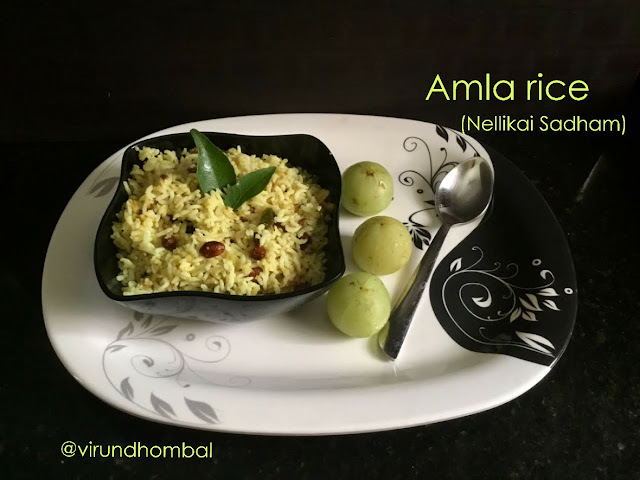 Nellikai Sadham - a healthy rice for your lunch box with simple cooking methods. Once again thanks to my Karthi Uncle who taught me the Aloo Gobi recipe prepared this healthy rice. 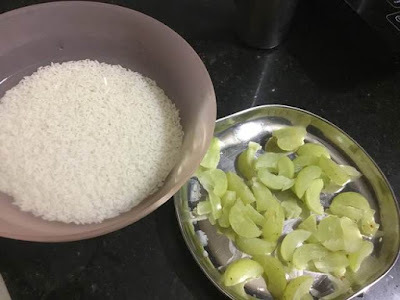 The way we prepare for lemon rice and mango rice applies to this Amla(Nellikai) rice also. In addition, we want to grind the amlas in a mixer jar without any water and then we have to saute it with our classic tempering ingredients. Ponni raw rice is much preferred when preparing these type of rice varieties, but if you are looking for a healthier choice you may replace it with cooked millets. Now a days we can see there is an increase in consumption of amlas in our regular diet because of its medicinal values. We can include it in a variety of ways in our diet as juice, powder and pickles. 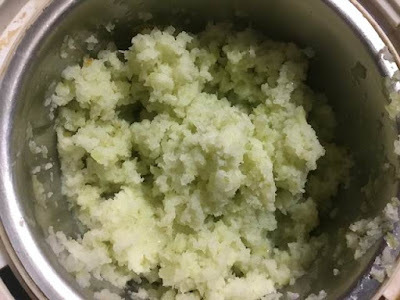 We steam the amlas in an Idli pot and add it to any kuzhambu or simply as a side dish for curd rice. This 20 minute easy rice dish can be prepared in advance and you can enjoy it warm or at room temperature. 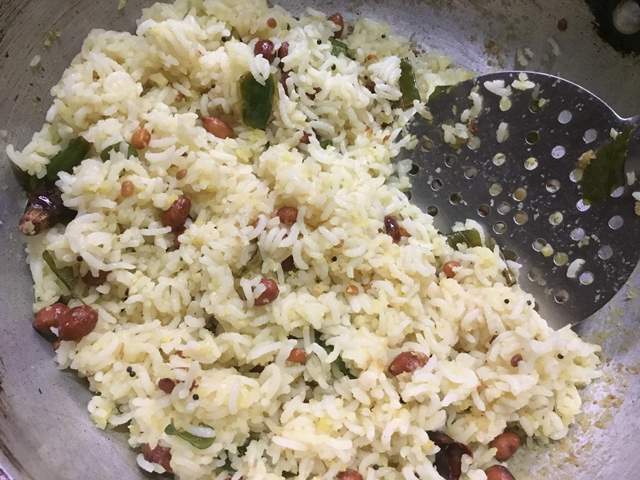 Green chillies and red chillies give the rice a more flavour for these types of rice dishes. So please do not omit or reduce it. In fact you can also include finely chopped ginger too to add more flavours. And do not forget our most important hidden star ingredient asafoetdia powder for this rice. Pair your Amla rice with any poriyal, kootu or any sundal and prepare a healthy lunch for your family. Measure the rice with your measuring cup and add it to a bowl. Rinse the rice thoroughly and add the rice directly to the pressure cooker and soak the rice with 2 cups of water for 20 minutes. After 20 minutes, close it with the lid and pressure cook for 2 whistles. Allow the pressure to settle down naturally. Wash the Amla and wipe them with a towel. 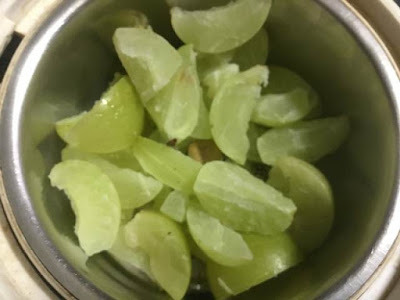 Slice them into small pieces and remove the seeds. 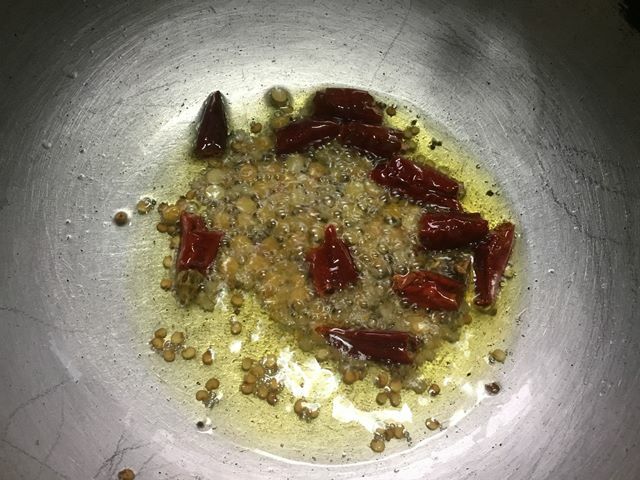 Add the sliced amlas in a small chutney jar and grind it nicely without any water. Open the pressure cooker and transfer the rice to a wide plate or vessel and add a tsp of oil over the rice. Heat oil in a kadai for 2 minutes and add the peanuts. Fry them well and add it to the cooked rice. Again add some more oil in the same kadai and add the mustard, urid dal, chana dal and broken red chillies. 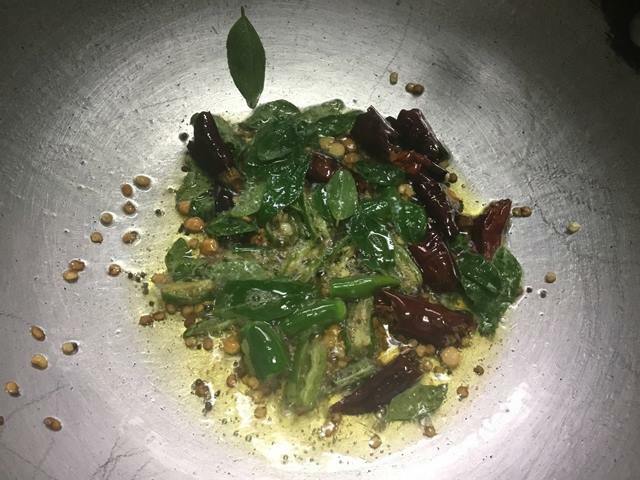 When it turns golden brown, add the green chillies and curry leaves. Saute them well until green chilly wilts. Next, add the ground amlas and mix them well with the ladle. Add turmeric powder and asafoetdia and mix them well with the mixture. 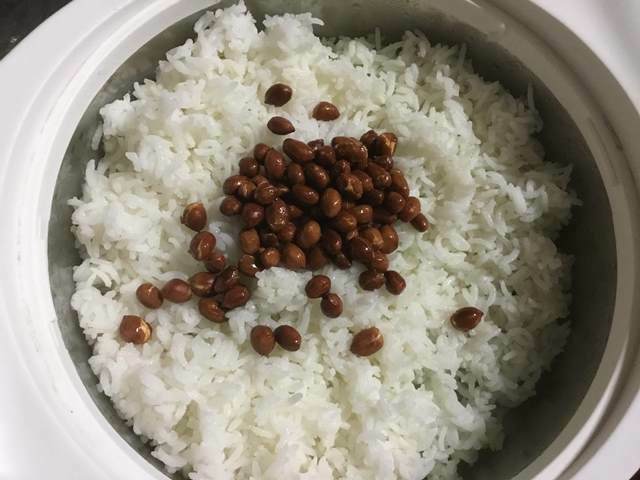 Reduce the heat to low, and add the rice. Stir them gently and add the required salt. Cook until the mixture is completely incorporated with the rice and turn off the heat. 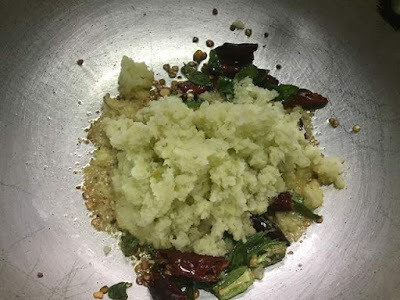 Close the rice with a lid for 20 minutes and serve it with any vegetable poriyal. Measure the rice with your measuring cup and add it to a bowl. Rinse the rice thoroughly and add the riceand soak the rice with 2 cups of water for 20 minutes. 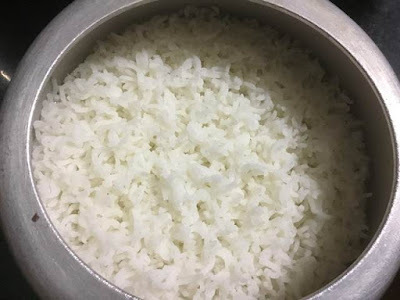 Soaking process gives you the rice separated which looks prettier for these kind of rice dishes. For direct cooking I always use Hawkins classic pressure cooker which gives perfect results. Wash the Amla and wipe them with a towel. Slice them into small pieces and remove the seeds. After 20 minutes, close it with the lid and pressure cook for 2 whistles. Allow the pressure to settle down naturally. Open the pressure cooker and transfer the rice to a wide plate or vessel and add a tsp of oil over the rice. Again add some more oil in the same kadai and add the mustard, urid dal, chana dal and broken red chillies. 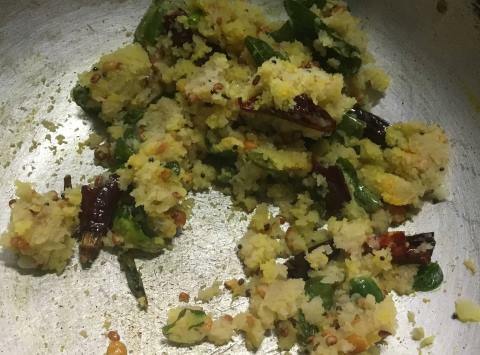 When it turns golden brown add the green chillies and curry leaves. Saute them well until green chilly wilts. Reduce the heat to low, and add the rice. Stir them gently and add the required salt. 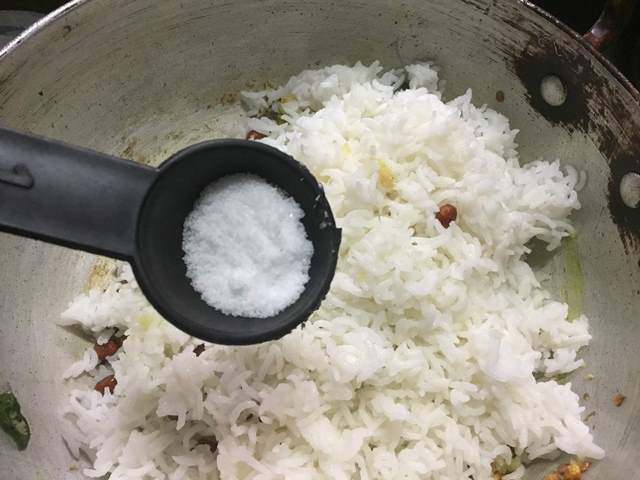 Cook until the mixture is completely incorporated with the rice and turn off the heat. Taste and adjust seasonings if needed. Close the rice with a lid for 20 minutes and serve it with any vegetable poriyal.